JEAN ASSELBORN, Deputy Prime Minister and Minister for Foreign Affairs of Luxembourg, said that when the Assembly recognized the full powers of the National Transitional Council in Libya, it consecrated the end to a dictatorial regime that had oppressed Libyans for 42 years. “The international community had to react, to recognize its responsibility to protect Libyan men, women and children,” he said. Indeed, the United Nations had acted in a decisive, timely and just manner, and Luxembourg stood ready to accompany Libya on its path to democracy. In Tunisia and Egypt, people also had prevailed in their quests for liberty, while in Syria, the regime continued to lead a brutal campaign against its people. All appeals to stop the violence had gone unanswered, and the Security Council must now assume its responsibility, as the Organization’s credibility as a moral force was at stake. But such an appeal on its own would not suffice, he said, stressing that direct negotiations between the parties must restart as soon as possible. He also fully supported the proposal made yesterday by the Quartet for a strict timetable of not more than a year to reach a comprehensive agreement. On a similar note, he said conflict prevention was a principal obligation of the United Nations. At the 2005 World Summit, world leaders committed to promoting a culture of prevention, for which the Peacebuilding Commission was an essential tool. Luxembourg contributed actively to its work as Chair of the Guinea-Bissau configuration. With respect to sustainable development, he said Luxembourg would do all in its power to contribute to the success of the 2012 “Rio+20” summit, adding that economic, social and environmental development — the three pillars of sustainable development — had long been at the centre of its development cooperation policy. Luxembourg had allocated 1.09 per cent of its gross national income in 2010 to official development assistance (ODA). Calling climate change a “threat multiplier”, he said his country offered technical assistance to small island developing States and had taken binding commitments to reduce carbon emissions. On non-communicable diseases, he said the response to that challenge must be global and universal, and he lauded the initiative of the Caribbean Community (CARICOM) in bringing that matter to the Assembly’s agenda. Rounding out his remarks, he said the United Nations had become the target of terrorist acts, but he cautioned against an inward-looking retreat. Such behaviour must exhort States to step up their efforts to further the ideals of the United Nations and its Charter — to fight together for a safer future, respect for human rights and the rule of law. “This is our joint responsibility,” he said, and Luxembourg stood ready to work towards an effective multilateral system. ansitional Council in Libya, it consecrated the end to a dictatorial regime that had oppressed Libyans for 42 years. “The international community had to react, to recognize its responsibility to protect Libyan men, women and children,” he said. Indeed, the United Nations had acted in a decisive, timely and just manner, and Luxembourg stood ready to accompany Libya on its path to democracy. In Tunisia and Egypt, people also had prevailed in their quests for liberty, while in Syria, the regime continued to lead a brutal campaign against its people. All appeals to stop the violence had gone unanswered, and the Security Council must now assume its responsibility, as the Organization’s credibility as a moral force was at stake. Turning to the Middle East, he said a solution to the Israeli-Palestinian conflict, which had poisoned the entire region, must be achieved through recognition of the right of both parties to live in a sovereign, viable State. Despite the hope raised last year by the United States President, there had been neither a stop to the illegal construction of settlements nor a lifting of the embargo on the Gaza Strip. He could only hope that the appeal by Palestinian Authority President Mahmoud Abbas for recognition of his people’s right to a State would be heard. But such an appeal on its own would not suffice, he said, stressing that direct negotiations between the parties must restart as soon as possible. He also fully supported the proposal made yesterday by the Quartet for a strict timetable of not more than a year to reach a comprehensive agreement. On a similar note, he said conflict prevention was a principal obligation of the United Nations. At the 2005 World Summit, world leaders committed to promoting a culture of prevention, for which the Peacebuilding Commission was an essential tool. Luxembourg contributed actively to its work as Chair of the Guinea-Bissau configuration. 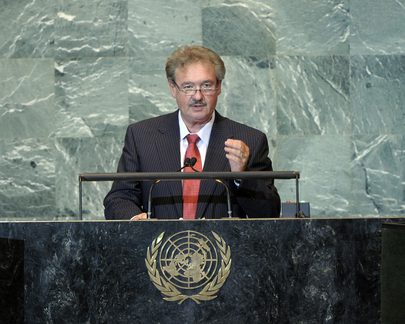 With respect to sustainable development, he said Luxembourg would do all in its power to contribute to the success of the 2012 “Rio+20” summit, adding that economic, social and environmental development — the three pillars of sustainable development — had long been at the centre of its development cooperation policy. Luxembourg had allocated 1.09 per cent of its gross national income in 2010 to official development assistance (ODA). Calling climate change a “threat multiplier”, he said his country offered technical assistance to small island developing States and had taken binding commitments to reduce carbon emissions. On non-communicable diseases, he said the response to that challenge must be global and universal, and he lauded the initiative of the Caribbean Community (CARICOM) in bringing that matter to the Assembly’s agenda. Rounding out his remarks, he said the United Nations had become the target of terrorist acts, but he cautioned against an inward-looking retreat. Such behaviour must exhort States to step up their efforts to further the ideals of the United Nations and its Charter — to fight together for a safer future, respect for human rights and the rule of law. “This is our joint responsibility,” he said, and Luxembourg stood ready to work towards an effective multilateral system.